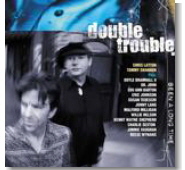 The long-awaited album from Stevie Ray's old band mates, Double Trouble, is featured as this month's Pick Hit. One of the finer soulful blues singers on the circuit today is Milwaukee's Johnny Rawls, with his latest JSP release Put Your Trust In Me selected as the March Surprise feature. Be sure to catch his duet with daughter Destini. If you missed this CD when it first came out in 1994, then start searching for a copy of the excellent Blue Bird from Chicago legend Jimmy Rogers, covered in this month's Flashback selection. This month's What's New section features reviews of new CDs from Johnny Jones & Charles Walker, Terry Evans, Guy Forsyth, Curtis Salgado, Rusty Zinn, Barbara Lynn, Larry McCray, and more.